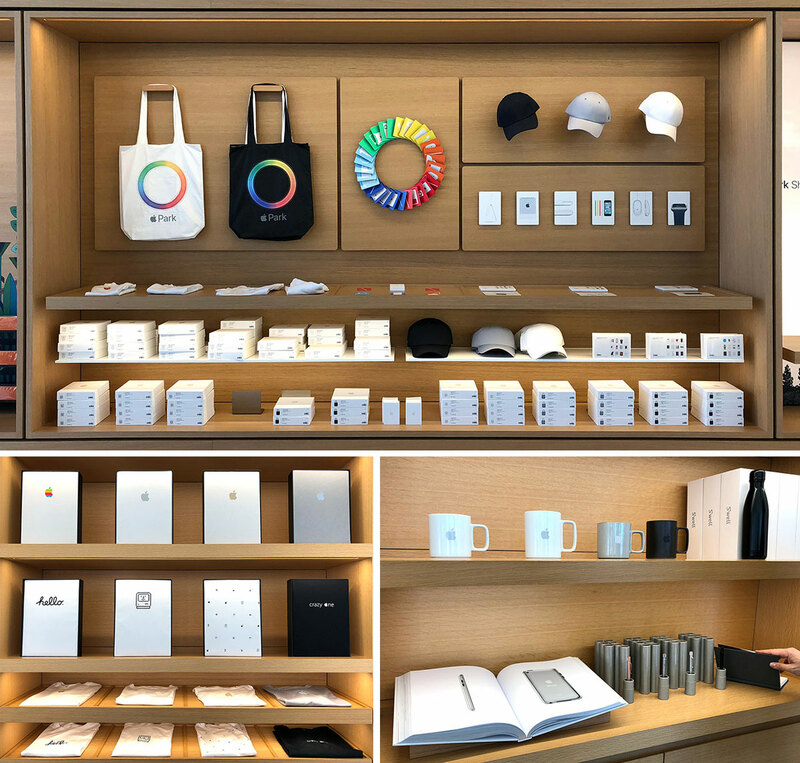 If you find yourself in or near Cupertino, and either are or know an Apple fanatic… it’s worth popping into BOTH the new Apple Park Visitors Store and the One Infinite Loop Store for gifts and offline exclusive goods… from t-shirts and totes, to hats, baby onesies, japanese hasami porcelain mugs, memory cards, postcards, iphone matching metal pens, swell water bottles, notebooks and more. And of course they are all beautifully packaged and perfectly gift ready. For whatever reason, the two stores have very different goods, so it’s worth seeing both - while Apple Park was an amazing space to go see, Infinite Loop had better products. (And keep in mind, products seem to rotate, so stopping by when in the area might be worth it?) Take a look at what we found there this week on the next page! On surprising birthday presents, just received the YETI Loadout Bucket complete with caddy and lid and i must say… who knew i could be SO excited about a BUCKET?!?!?! Like all things YETI, all items feel over designed (physically + graphically) in a fantastic way. Non slip, food safe, super strong, comfy handle… every detail has been carefully thought through. Even amazing little details like the super strong lid that basically looks like a giant version of what you’d find on their Rambler tumblers (but with super hexs! )… and the caddy has a handle that drops down so you can put the lid on! 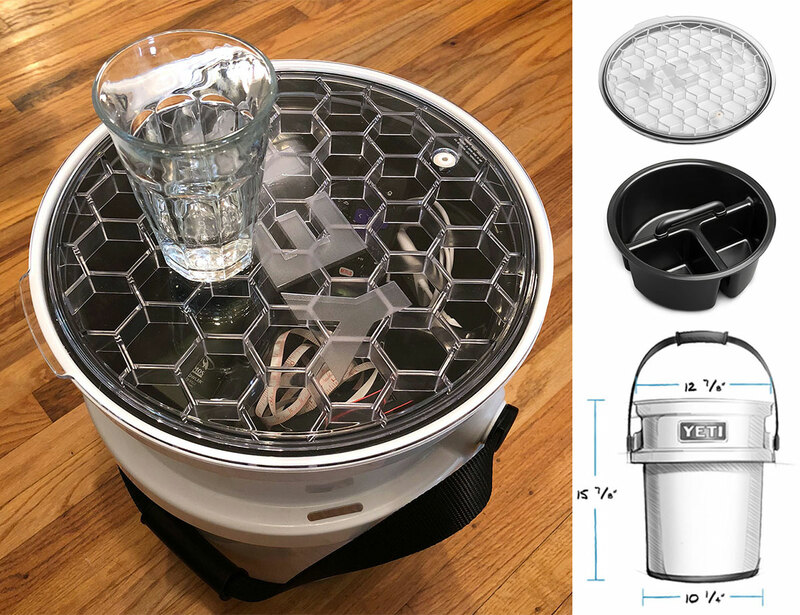 And while you can use the bucket for everything you can think of (and they have quite the list of ideas too - be it for fishing, hunting, camping, brewing and beyond…) it’s also functionally solid enough i’m currently using it as a stool/storage/side table in the living room. Even the packaging of the accessories is impressively over designed! Take a look at all the details on the next page. Tiffany Bozic creates breathtaking paintings of surreal creature juxtapositions. Her book, Drawn By Instinct, a collection of her 2003-2011 work is a favorite on my bookshelf! I just came across her latest show, Spectrum at the Joshua Liner Gallery and the use of acrylic on maple panel look breathtaking! 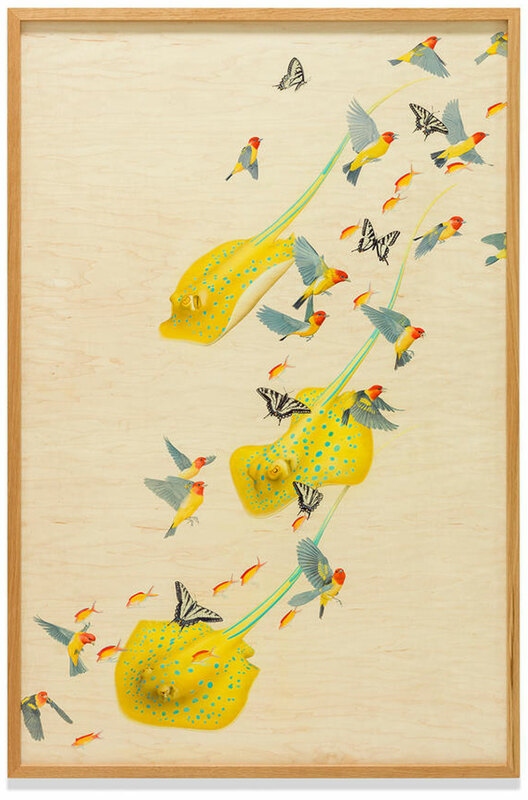 The way she works the creatures in and out of the grains of the wood… stunning! Take a look at some of my favorites on the next page! It’s been a little while since i’ve seen pictures of a gallery show floating around the feeds and thought - omg i need to see that! Well Yoskay Yamamoto’s Homebound show at GR2 did just that, and we luckily happened to wander by after dinner on the closing day of the show! 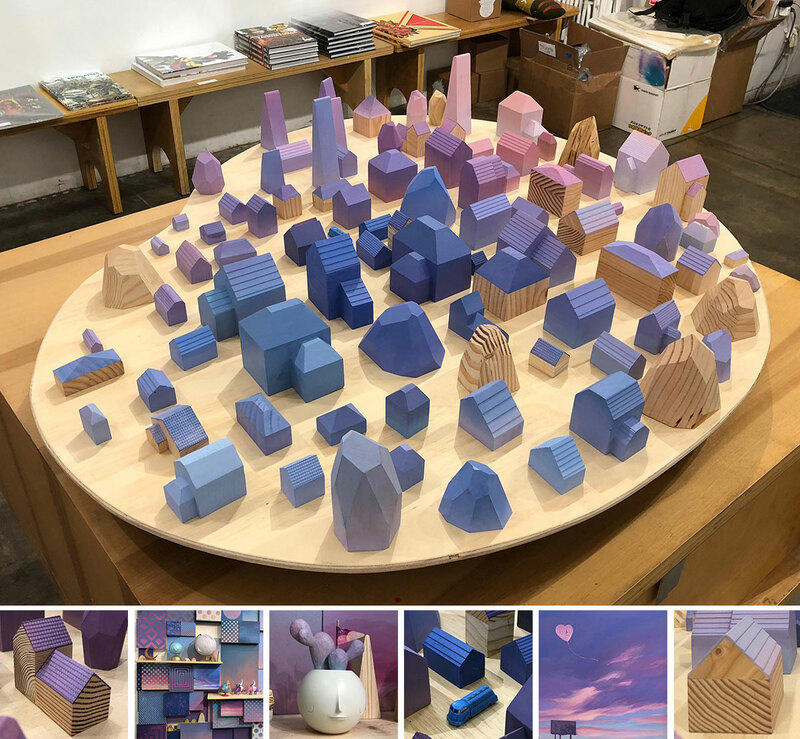 The Sunset Village with Lavender Moon installation steals the show. (Even though previous photos made me expect to walk into a room FILLED with MUCH larger little houses!!! Which would still be an incredible exhibition that i would definitely HAVE to see.) Beyond the gorgeous palette, there are so many delicate and precise details that pull you in - from the shingles on the roof to the grain in the wood… i couldn’t stop staring, and even had to remind myself to snap a few pictures so i could remember it forever. Take a look on the next page! p.s. I’m not sure if it’s the residential real estate projects we’ve been working on lately, or just thinking about single family homes and researching so many aspects of them daily… but definitely feeling extra drawn to the mix of art + houses! Now i’m itching to make minis of our actual houses… or paint one inspired by these! 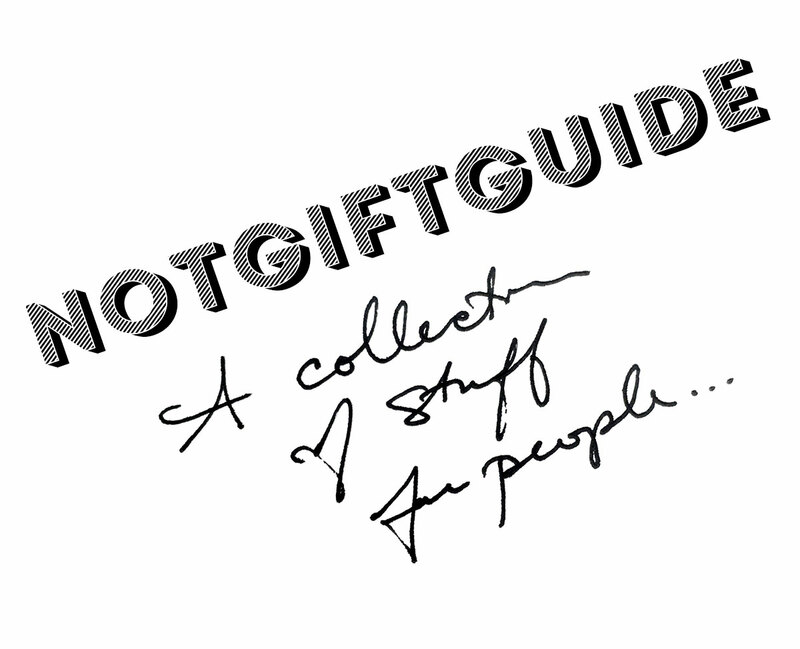 Gift guides often get so formal with the categories and over-simplification of your recipient’s interests… or they push things people want you to buy so hard. This is more just a list of awesome stuff we like that you COULD give someone - or buy for yourself. The only criteria? We like it. Explore the collection on the next page! How can you not smile when you see a bunch of realistic little birds with party hats made out of flowers and leaves on their heads? 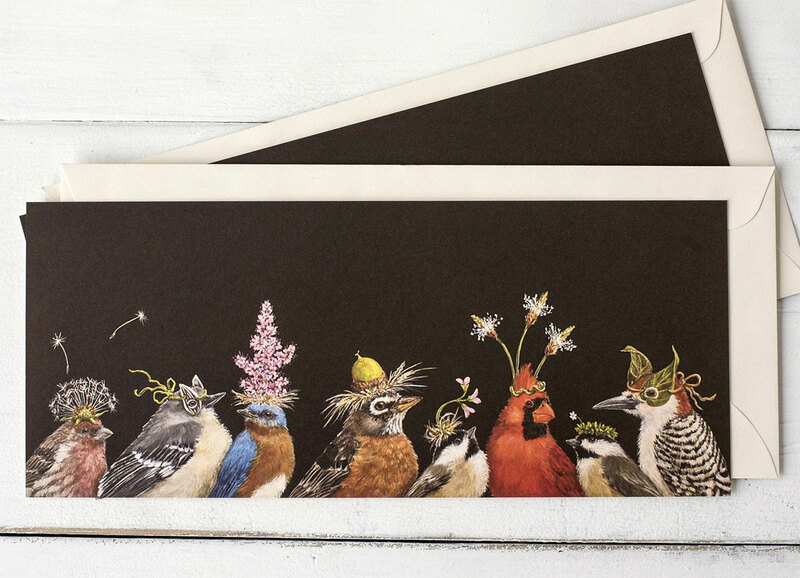 We received one of Vicki Sawyer’s playfully illustrated bird party cards a while back, and i only just dove into the rest of her work! It turns out she has quite the line of cards, placemats, place cards, and even a coloring book with Nashville based, Hester & Cook, and she is actually based right in Franklin, TN! In addition to birds, you’ll find lots of other creatures ~ from dogs to sheep to pigs and more, also, of course, with fun hats and accessories. Additionally, her artwork has been licensed on other products as well, from embroidery kits to mugs and more. She has also created three party bird filled books which can be ordered in print or digital forms. But first, take a look at some of my favorite Hester & Cook by Vicki Sawyer picks on the next page! Jet.com goes private label with their latest line Uniquely J. Whether the products are any good - i have no idea, BUT the packaging! It’s bold, super graphic, and you can’t help but take notice (whether you love it or hate it - running it by friends, i’ve gotten both responses. It’s certainly polarizing!) 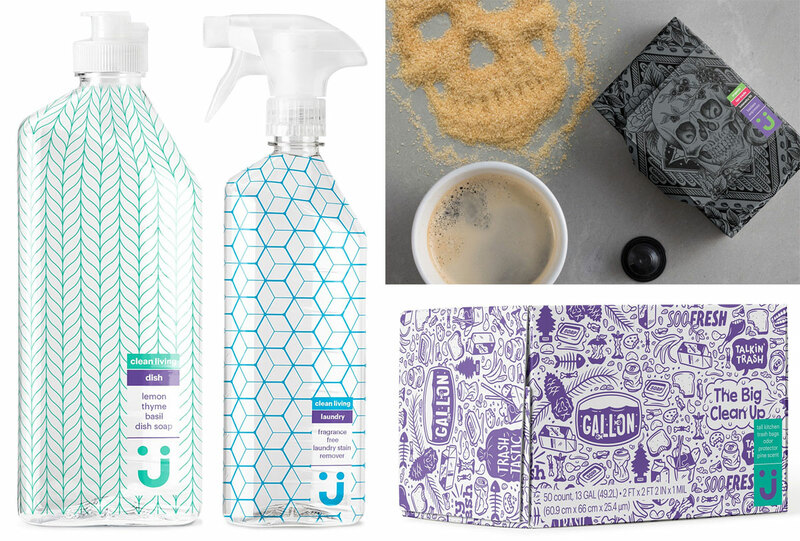 Personally, the household cleaners grab me the most… then the skull graphic on the espresso pods… then the playful generic-Ziploc/trash bags box graphics. The crisp single colored patterns on the clear product are a refreshing look for the cleaners. The purple plaid on the paper goods are a bit intense for me though. The packaging was designed by Elmwood that has a great Uniquely J Case Study up. See more details of my favorites on the next page! I love Brendan Monroe’s blobs… especially as murals! The black and white crispness combined with so much fluidity! And it’s so fun on this collectible growler for Nucleus Portland! Are growlers going to be the new t-shirt or tote bag? While i can’t stop staring into the gif above… see more details on the next page! 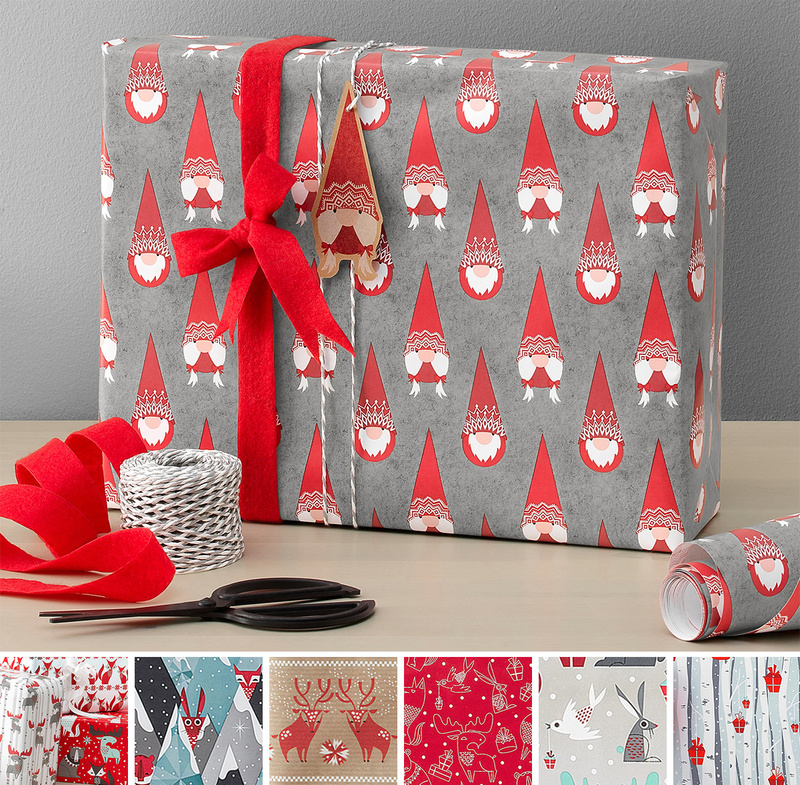 On adorably cute, happy, festive things (even though it’s mid October and feels WAY too early for xmas) - just came across the holiday displays at IKEA, and the IKEA Vinter 2017 collection of gift wrap made me smile! The playfully hairy gnome/elf/santa guys are too funny and the wintry woodland creatures are just so cute! From the popping eyes of the rabbits to the wiggly antlered moose and the serene deer and bears and more… Take a peek at my favorites on the next page! AbsoluteXtracts and Jeremy Fish teamed up for a premium limited edition FISH TANKS! And while I shared it on NOTCOT.org a while back, i finally found one and it was too cute to resist (also that Tangie is delicious and potent) and HAD to share close up pics! It’s even nicer in person! The Premium Limited Edition FISH TANKS spared no detail - complete with Custom Gold Fish Scale battery (that is compatible with most other cartridges! 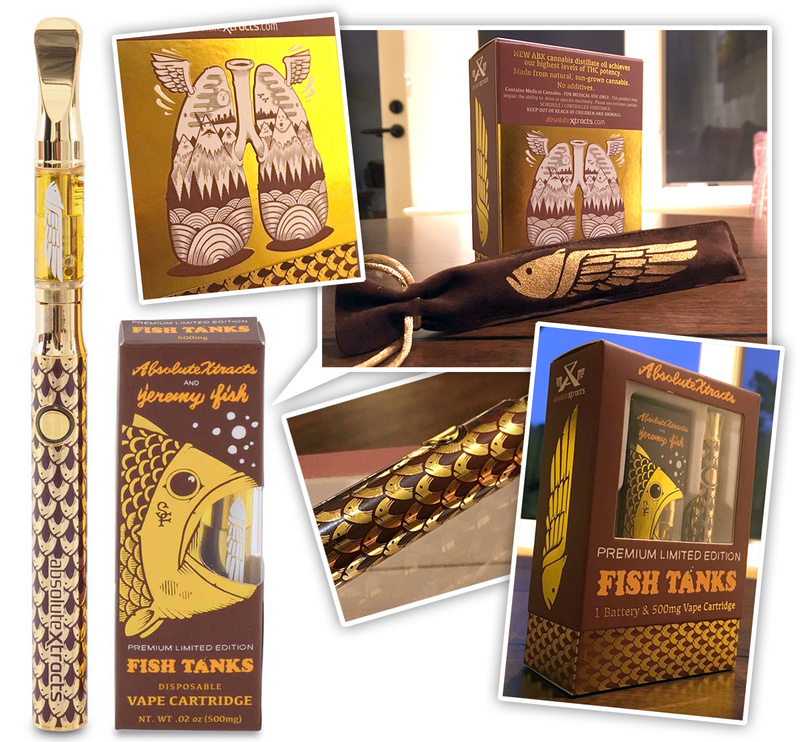 ), Premium Gold-tipped ABX Tangie cartridge (with fish! ), collector’s edition packaging, and velvet vape carrying case. Dare i say, it feels absurdly fancy in the funnest, silliest way possible? It’s such a fun mashup of the art of Jeremy Fish and FISH and quite the conversation starter compared to those boring vapes. The Path of TOTALITY! What a phrase. 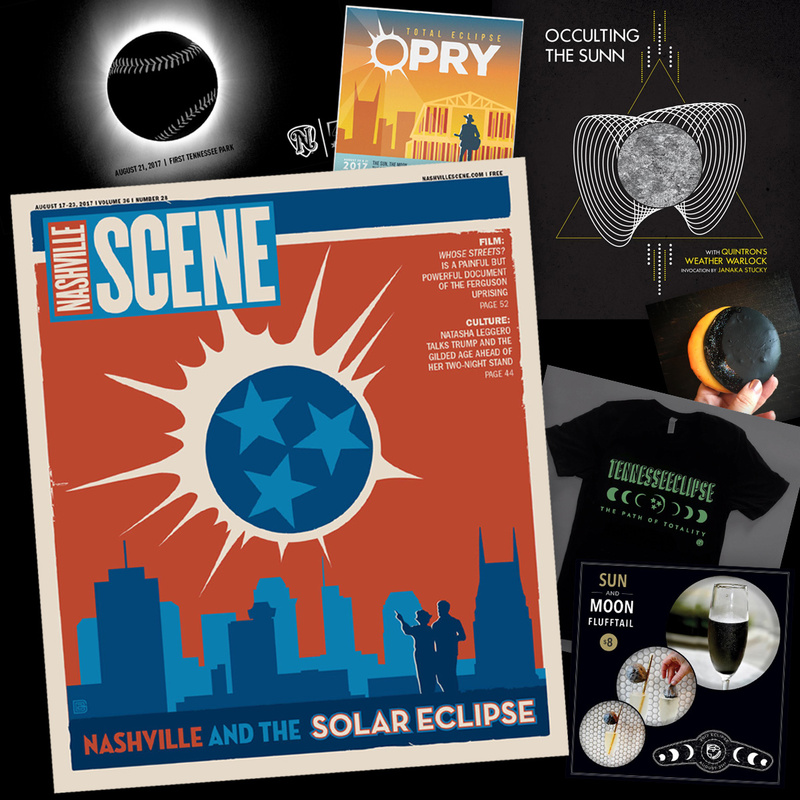 Can you believe the hype and merch madness going on across the US in preparation for tomorrow’s solar eclipse? A lot of it is pretty painful. Yes yes, from a fascination of space and nature standpoint it’s truly awe inspiring… but putting that aside for this post, it’s been hard to ignore the creative inspiration it’s triggered as well! Ready for Eclipse Graphic Overload? To the next page! New NOTlabs project in the wild! Here are the invitations for the 2017 Coca Cola CMO Leadership Summit! Focusing on the theme of “thriving in the next industrial revolution,” to demonstrate human and robot symbiosis, we created a sculpture of a human hand and a robot hand coming together. Part invitation and part desk object, they are perfectly suited to hold your phone or business cards. These handmade pieces are cast in resin, painted, and mounted on laser etched wood bases that have the light bulb logo on the top, and a quote and logos on the bottom. We made a first run of 130 pieces, packed them up, and shipped them all over the US, but not before taking some photos to share with you! Take a look at the details and making-of on the next page. 1964 Supply Company! There’s such a natural connection between art + cannabis, i’m surprised we haven’t seen more collaborations so far! Of course these caught my eye, because i’m a huge fan of Jeremy Fish, but the other artists working with 1964 Supply Company are great too (including Tristan Eaton, Katie So, Joe Wilson and Ben Tour!) Why 1964? “We named ourselves the 1964 Supply Company partly to recognize the year that Professor Mechoulam discovered the THC molecule; the psychoactive component in cannabis,” says their about page. 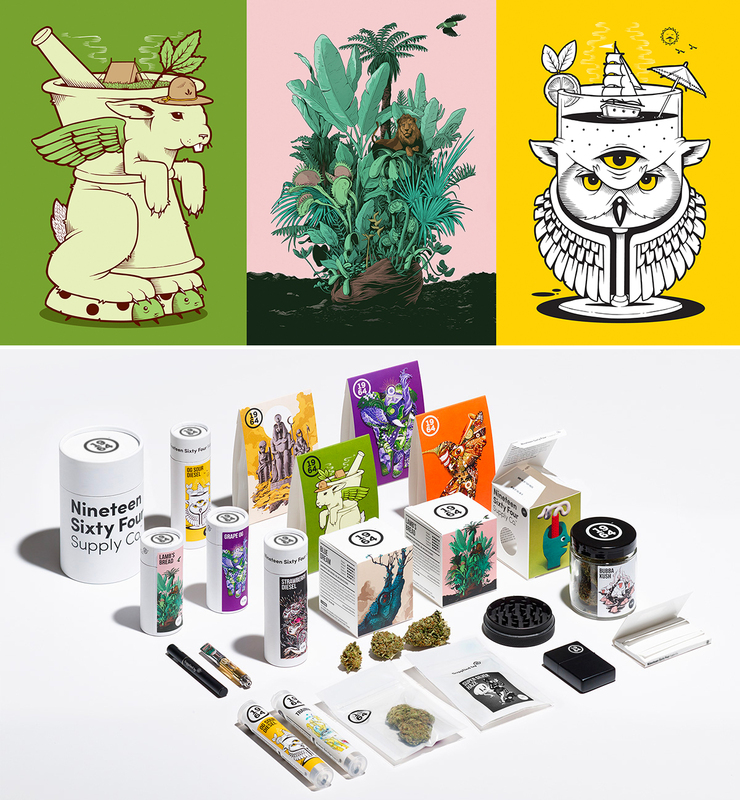 Their product lines include flower, vapes, and pre-rolls all beautifully packaged and displayed to show off art inspired by the various strains. Take a peek at some of their fun packaging and art on the next page! p.s. If you’re in LA next week, they are having a launch party coinciding with the Secret Walls 11th Anniversary Art Battle! Did you know how many FREE resources you have to read DIGITAL books and magazines these days? And i’m not talking weird, creepy, random zines and ebooks you never wanted in the first place… i mean everything from bestsellers and cookbooks to italian fashion magazines and newspapers around the world! How did i not know i could read some of my favorite (and pricey on newsstands) international design magazines online for free? And easily “borrow” ebooks i’ve been tempted by (or even impulse bought) online for free? And if you did know, why didn’t you tell me??? 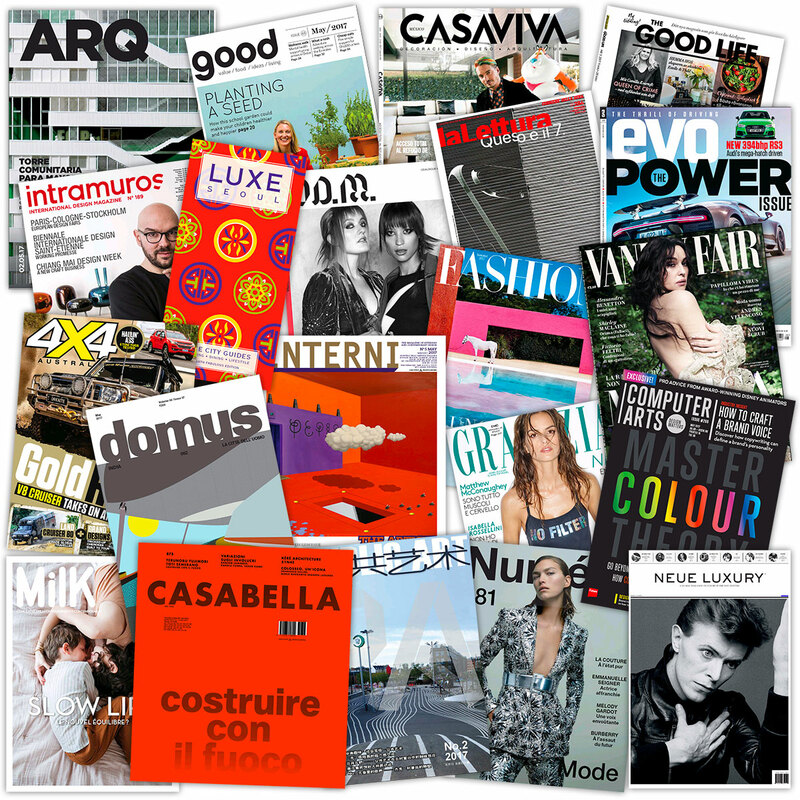 I’m a magazine addict, since long before i started blogging in 2005. Print magazines and catalogs were my happy place as a kid ~ nothing like vibrant images to happily distract me. Perhaps it’s only natural i ended up in design, and eventually with all these websites sharing all my visual inspirations? For the last 12 years, i’ve read a few hundred websites a day in a ridiculous amounts of tabs… my digital newsstand of sorts? I can’t resist a stack of magazines to pick through while waiting at the salon or a doctor’s office. My favorite part of airline lounges are the magazines you don’t find everywhere else. And i go weak in the knees at a good newsstand ~ especially when traveling ~ where i can’t help walking away with an armful. Also before screens and wifi took over airplanes, i would indulge in grabbing a book at the airport and happily devour it during a flight ~ my cherished travel rituals as a teen. Take a peek on the next page for some of the best resources i’ve found to take my magazine addiction to a whole new level.